A producer of restriction endonuclease AjnI has been isolated from natural resources and identified as bacterial species Acinetobacter johnsonii R2. 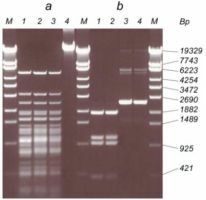 The restriction enzyme purification and estimation of its activity is described. It has been shown that AjnI produces DNA fragments with 5'-CCWGG sticky ends similar to EcoRII, but cleavage is not blocked by dcm-methylation. A new restriction endonuclease AjnI may be widely used in genetic engineering. EcoRII restriction - modification system were discovered among the first RM-systems [1, 2]. EcoRII restriction endonuclease produces DNA fragments with 5'-CCWGG sticky ends (where W - A or T) . DNA- methyltransferase M.EcoRII modifies internal cytosine of both strands of recognition sequence protecting bacterial DNA from the cleavage by EcoRII restriction endonuclease [1, 4]. Many laboratory E. coli strains have dcm-methyltransferase [5, 6] which modifies DNA similar to M.EcoRII. Plasmid DNAs isolated from these E.coli strains are resistant against cleavage by EcoRII. This is an obvious limitation of EcoRII application in genetic engineering. There are some isoschizomers of EcoRII named ApyI , MvaI [8, 9], BstNI [10, 11] and others, which are not blocked by dcm-methylation, but cleave the same DNA sequence in another way: 5'-CC^WGG-3'. Such isoschizomers may replace the prototype, however, not in all situations. For example, in the experiments on plasmid libraries preparation, it is convenient to use a vector molecule linearized by rare-cutting enzyme and short DNA fragments which may be produced by 4-bp recognition restriction endonuclease. However, both these enzymes should produce the same sticky ends. There is such a couple of enzymes SexAI (recognition sequence 5'-A^CCWGGT-3 ') and EcoRII (5'-^CCWGG-3 '). Unfortunately, both these enzymes are sensitive to dcm-methylation. Recently we have discovered MabI - isoschizomer of restriction endonuclease SexAI which is not blocked by dcm-methylation, but similar isoschizomers of EcoRII are unknown. 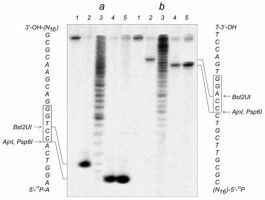 In this work we describe isolation and an investigation of some properties of the new restriction endonuclease AjnI from bacterium Acinetobacter johnsonii R2 which is the isoschizomer of EcoRII. Activity of AjnI is not blocked by dcm-methylation. A search of restriction endonucleases was carrying out according to [12, 13]. The producing strain A. johnsonii R2 (SE collection of microorganisms #5M95) was isolated from natural water supply and identified according to [14, 15]. A. johnsonii R2 was grown in a special media containing 10 g/l trypton, 5 g/l yeast extract, and 5 g/l NaCl, 0.5 g/l MgCl2, 0.01 g/l thiamine at pH 7.5 and 28°C with aeration. Cells were harvested by centrifugation when the culture reached the stationary phase. 20 grams of the frozen cells biomass was suspended in 60 ml of 0.2 M NaCl and 0.3 g/l of lysozyme and incubated 16 hours. Cells were disrupted by sonification and centrifuged. The enzyme isolation was performed at 4°C. All solutions included buffer 1 (10 mM K-phosphate buffer (pH 7.2), 7 mM betta-mercaptoethanol and 0.1 mM EDTA). Supernatant after centrifugation was diluted 3 times by buffer 1 and loaded on 40 ml of P11 phosphocellulose (Whatman, UK). A column was washed by 0.05M NaCl in buffer 1 and than a gradient of 0.05-0.6M NaCl in buffer 1 was used to eluate the enzyme. Enzymatic activity was determined in SE Y-buffer at 55°C with subsequent analysis of the reaction products by electrophoresis in 1% agarose according to . Fractions with enzymatic activity were loaded on 5 ml of hydroxylapatite (BioRad, USA) column, washed by 0.2M NaCl in buffer 1 and than a gradient chromatography was carried out from washing buffer to 0.2M NaCl, 0.25M K-phosphate in buffer 1. Fractions with enzymatic activity dialyzed against buffer 1 and loaded on 4 ml of heparin-sepharose (Sigma, USA). A column was washed by 0.05M NaCl and enzyme was eluated by NaCl gradient 0.05M -0.6M. Fractions with AjnI dialyzed against buffer 1 with 50% glycerol and stored at -20°C. Optimal buffer for enzyme's activity was determined by a direct comparison of DNA pattern cleavage in 5 SE buffers at 30°C, 40°C, 50°C, 60°C and 70°C. 32P-labeled oligonucleotide (5'-AAGGTCACCTGGGACGAACGCGTCGACCGGTATACTAA-3') with a corresponding complementary strand was used to determine the phosphodiester bond to be hydrolyzed. The oligonucleotide duplex was synthesized according to  and was cleaved by restriction endonucleases AjnI, Psp6I and Bst2UI. The products of hydrolysis were separated by electrophoresis in 20% polyacrylamide gel in the Tris-borate buffer in the presence of 7 M urea. DNA ladder was prepared from oligonucleotide by a treatment with exoIII. Resulting gel was scanned in Cyclon (Packard,USA). The DNA preparations, oligonucleotides, and restriction endonucleases used in this work were from SibEnzyme Ltd. (Novosibirsk, Russia). Bacterial strain - producer of restriction endonuclease AjnI has the following characteristics. Cells are short rods, not motile, in the size 1,3x2 micron; occur as single, in pairs, and also in chains; do not form spores. Gram-negative and stained cells look as cocki in pairs. The strain is aerobic, catalase-positive and oxydase-nagative. The strain grows on the minimal agar with ethanol, acetate, alanine and arginine but doesn't not grow with glucose, lactose, rhamnose, arabinose, sacrose, maltose, galactose, sorbitol, mannitol, dulcitol inositol, glycerol, citrate, glycine, ornithine and histidine. The strain forms the small amount of acid at growth on a nutritious agar with ethanol, but not with carbohydrates or with multinuclear spirits. The starin does not hydrolize gelatin. The strain grows at concentration NaCl from 0 up to 3 %, ðÍ 6.8 - 7.7, temperature from 4°C to 30°C, but not at 37°C. It is sensitive to ampicillin, kànamicin and chloramphenicol, but it is resistant to tetracycline at concentration of an antibiotic in a nutritious agar of 0.05 mg/ml. In nutritious broth Luria without stirring the culture forms homogeneous dregs and a deposit, and forms a superficial film at concentration NaCl of 1.5 and 3 %. On a nutritious agar of a colony grew for 2 days at 22°C and were round, creeping away up to 2 cm in diameter, flat and little bit convex in the center, crude-brilliant, translucent, grayish with a salad shade. The strain was identified according to  as a species Acinetobacter johnsonii R2, and its restriction endonuclaese have been named AjnI according to . Biomass of A. johnsonii R2 was grown at aeration in modified Luria broth. Yield was 4 g cells from 1 litre of a media. Enzyme was isolated from a cellular extract by consecutive chromatographic steps as described in the methods. 3.5 ml of enzyme AjnI with activity of 5000 units/ml were received from 20 grams of frozen cells. Optimal conditions of restriction enzyme's reaction were determined comparing activity in five SE standard buffers (see methods and the table). AjnI is most active at 55°C in buffer Y. Recognition sequence and dcm-sensitivity of AjnI was determined by comparison of pBR322 dcm+, lambda dcm- and lambda dcm+ DNA cleavage by three enzymes (Fig.1). We used AjnI, Psp6I (which is blocked by dcm-methylation), and Bst2UI (which is not dependent on dcm-methylation). The experimental data show that AjnI, Bst2UI and Psp6I identically cut lambda dcm- DNA (Fig.1a, lanes 1-3). Thus, AjnI recognizes nucleotide sequence 5 '-CCWGG-3. Fig.1b shows the cleavage of pBR322 dcm+ by all these enzymes. Bst2UI and AjnI cleave this DNA whereas Psp6I doesn't cleave pBR322 dcm+. So, AjnI recognizes 5'-CCWGG-3' and isn't sensitive to dcm-methylation. Fig. 1. Determination of recognition sequence and dcm-sensivity of AjnI. a) lambda dcm- DNA; b) pBR322 dcm + DNA ; 1 - Bst2UI; 2 - AjnI; 3 - Psp6I; 4 - native DNA; M - DNA ladder, lambda DNA/BssT1I. however, AjnI isn't sensitive to dcm-methylation. In a database there is no similar isoschizomers of EcoRII. We believe that enzyme AjnI will find a wide application in molecular biology investigations. Buryanov, Ya.I., Baryshev, M.M., Kosykh, V.G., Baev, A.A. // J. Cell Biochem. Suppl. - 1989. - V. 13D. - P. 211. A management to practical employment on microbiology. / Ed. Egorov N.S. - M., 1995. Bergey's manual of determinative bacteriology. / Ed. Holt J.G., etc. : 9 edition in 2 volumes: Rus. transl. by ed. akad. Russian Academy of Science G.A. Zavarzin, - M., 1997. Maniatis T., Fritsch E.F., Sambrook J., Methods of genetic engineering: Molecular Cloning. - Rus. transl. - Ì., 1984.